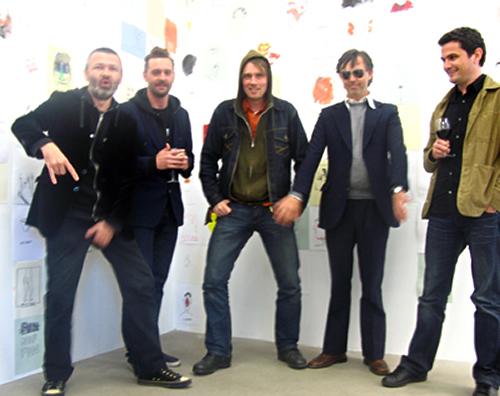 Tegneklubben (The Drawing Club) is a collaborative artist collective consisting of Paul Dring, Terje Nicolaisen, Ulf Carlsson, Martin Skauen and Bjørn Bjarre. They meet sporadically to drink bear, eat cheese doodles, draw and chat about almost everything, except the unchatable. During the sessions the drawings turn from promising to bad, and sometimes from uninteresting to funny. Of all the thousands of drawings the club has produced, there are some that we actually like! Tegneklubben never erase a line, they never sign a drawing, and they never talk about Tegneklubben. Their mission as artists is to fight the power of the art bureaucracy and the instrumentalization of meaning, and they also work hard to blur the line between drawing and their drawing equipment. Together they yearn for a certain kind of uncompleteness that can only be accomplished by accumulating endless piles of paper. Some of their most popular subjects include the power of language, meta art-world commentary, sublimity, bad painting, eroticism and the nasty body, color-field psychosis, dysfunctional furniture, portraits of gnomes and ideas for unrealizable public art projects.